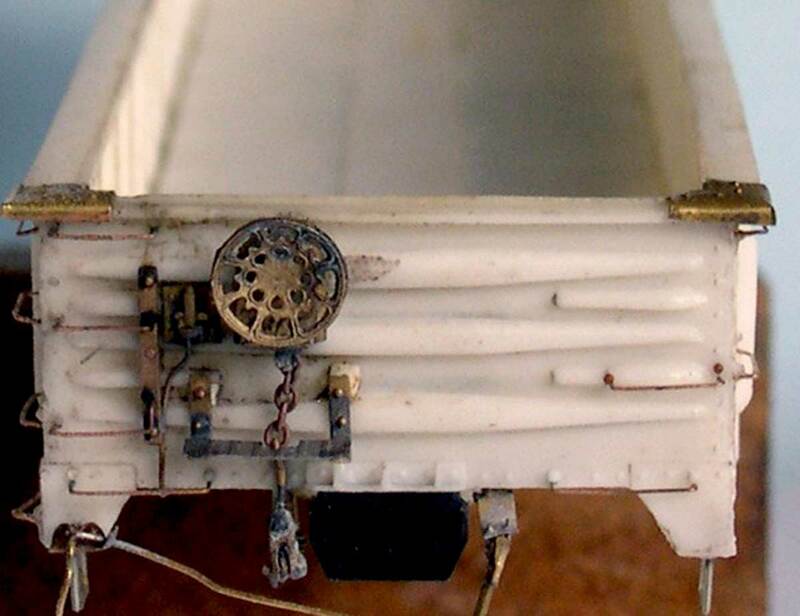 Bill Pardie sent a note and some photos of his Missouri Pacific gondola build about the time Bill Welch posted his tips and techniques on the model. We thought it would be neat to show another Bill’s version of the same MP gondola kit! Here’s Bill Pardie with comments on his kit build. 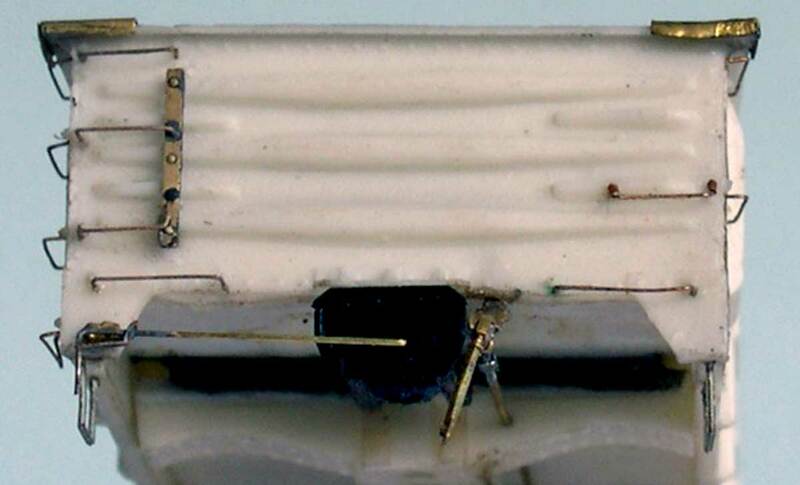 My initial venture into serious model railroading was in detailing brass locomotives. I then wanted the rolling stock to be as well detailed as the locomotives. This started out with Ambroid and Quality Craft kits as these kits were the only way to have stand-off grabs and ladders without performing major kit surgery. I now want the trackwork to be as well detailed as the models, but that is another story. This particular gondola has long been a favorite prototype of mine. I initially purchased a Suncoast wood kit, but it was never built. When Sunshine came out with their kit, I purchased and built one. When completed, I attempted to put a sand load in it by moistening the sand and adding an adhesive. By the next morning the sand had expanded and cracked the sides. When I saw the Funaro & Camerlengo kit I knew that this was it. The inside of the panels were hollowed out and the interior detail was great. Because of this I wanted to run the car without a load. After much thought, I bought a second kit and made a sandwich out of the two floors and a flat weight. I cut off the ends of the lower floor at the bolster so that the couplers would sit properly. The underbody and details were all done in brass, as is my preference on all of my models. There are numerous scratchbuilt parts, as seen on the above two images of the ends. I thank several members of the Steam Era Freight Cars YahooGroup who contributed information that kept construction moving forward. It takes me a long time to complete a model as I tend to drift in and out of projects. The hidden benefit of this is that you are continually looking at the model project with fresh eyes. I find that photographing the model in various stages of construction and completion can highlight flaws and poor modeling. The images push my efforts further along in the kit construction. 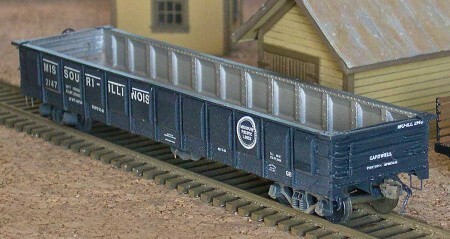 When it was time to paint the model, I recalled an issue of the MP Historical Society publication that featured gondolas. An overhead shot in the magazine revealed an unpainted interior. A knowledgeable MP fan confirmed that the MP did not paint all gondola interiors. When I painted my model, I shot the inside of the car with a steel color and all the detail really popped out! You may notice in the completed model images here that one of the legs of the N in NOIS has gone missing. At some point, I’ll return to this model to make another correction. A Gerry Glow decal set was applied just before the 2015 Naperville RPM event. Much of the detail was swallowed up by the paint but I know it is there. Another detail that disappeared was an etched trust plate mounted on the first panel. I trust that weathering will bring most of this back. Thanks to Bill Pardie for submitting some photos and descriptions of his gondola model. Questions and comments can be posted below. Please follow the instructions so your comment can be posted. All comments are reviewed and approved before they appear. I have two of these gondolas to build at some point and the article will be helpful for the build. I would like to know where to get the etched trust plate. The trust plates came out of a Speedwitch kit.